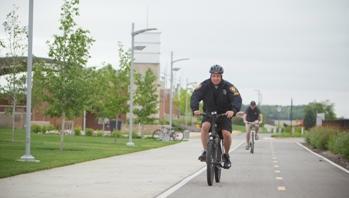 The Rock Island Police Department Bicycle Patrol Unit is a specialized unit within the Patrol Division. Approximately 40 Rock Island Police Officers have attended an intensive 40 hour training course to become certified as Bicycle Patrol Officers. The Bicycle Patrol Unit also performs a public service to the youth in the community by offering bicycle rodeos for interested Rock Island schools and other community organizations. A bicycle rodeo is an opportunity to educate 3rd, 4th and 5th grade students about the safety aspects of riding a bicycle on streets and roads, while practicing and developing skills that will help them become better bicyclists. To request a bicycle rodeo Email the Bicycle Patrol Supervisor, Sergeant Kirk Pattison.